Performance Metal Roofing | Painting | ME and NHPerformance Roofing, Inc.
Painting Repairs are, unfortunately, all too common. Many things can lead to the need for Painting Repairs, but the most common are ice damns, and weather wear and tear. Repairs can also be necessary as a result of neglect, poor installation, malfunction, or age. Painting Repairs can be caused by neglect or poor instillation. You will see paint labeled as interior or exterior. You can use water based paint on the interior of your home, but exterior paint is best left to oil based varieties. Oil based exterior house paint takes more time to dry than water based interior house paint, which dries as fast as moisture can evaporate. However, there are drying additives in oil based paints to aid in shorter drying times. The finish of oil based paints is glossier and harder than water based. Water based paint is not as durable as oil based, and isn’t as shiny. In order for you to clean oil based paint you will need to use harsh chemicals like paint thinner. However, a small amount of detergent and water will allow you to clean water based paint. 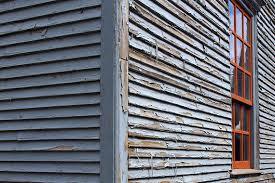 Why Maine and New Hampshire Should Hire Us for Exterior Painting Repairs?